The latest model from the leading electronic larynx company in the world yet again sets new standards of excellence. Sophisticated electronics, to give maximum quality of sound and rehabilitation over many years of use Ð the hallmark of Servox. The latest model from the leading electronic larynx company in the world yet again sets new standards of excellence. Sophisticated electronics, to give maximum quality of sound and rehabilitation over many years of use – the hallmark of Servox. Individually programmable buttons – enabling the possibility of programming both buttons with different volume and frequency settings. In addition to the basic manual settings, the digital electronics make it possible to connect the speech aid to your PC via a serial interface. Special software enables you to make and save a multitude of individual settings. 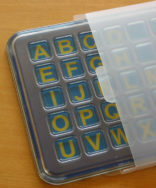 A useful tool for Speech Therapists, when using the Digital Data Communication Kit. 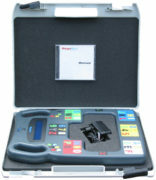 A flashing red light on the Servox digital indicates that the battery is on reserve and requires charging. An elaborate energy management system protects the battery from being completely discharged while speech duration is increased by reduced energy consumption. The intelligent charging technique offers the simplest, safest and quickest way to charge your reliable Servox batteries. The battery can be kept in the Servox digital during charging. A replacement battery can also be charged at the same time. The user can change or remove the carrying cord. If the carrying cord has been removed, the opening can be closed using the cord protector. The dark blue nylon hip bag gives the Servox digital a compact and up-to-date look. A separate compartment makes it easy to safely carry a replacement battery. The close to touch closure on the rear side allows you to adjust and attach the bag to suit different belt widths. Using the latest technology, perfectly constructed workmanship and a high-quality titanium housing, Servox can guarantee long durability, safety and optimal speech readiness at all times. The high value of the device is emphasised by the classic design and attractive colour scheme. 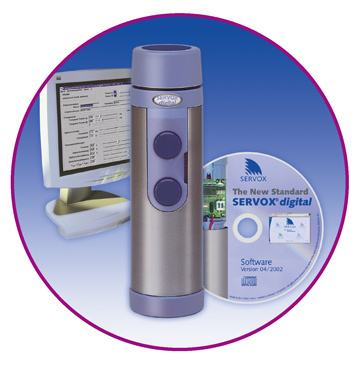 The Servox provides Digital Electronics with Serial Interface. Special software enables you to make a multitude of individual settings. Processor-Controlled Charger: This intelligent charging technique offers the simplest, safest and quickest way to charge batteries. 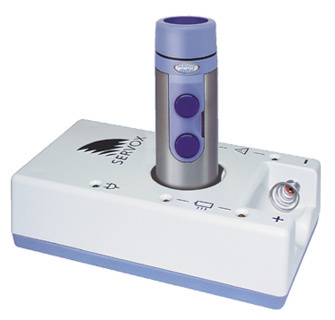 Individually Programmable Buttons: The Servox digital is the only speech aid which offers the possibility of programming both buttons with different volume and frequency settings. This makes it possible to pre-set the device for use in certain situations. The software also offers additional options for adjusting the tone to match the natural speech melody. Optical Battery Control A flashing red light on the Servox digital indicates that the battery is on reserve and requires charging. An elaborate energy management system protects the battery from being completely discharged while the speech duration is increased by reduced energy consumption.